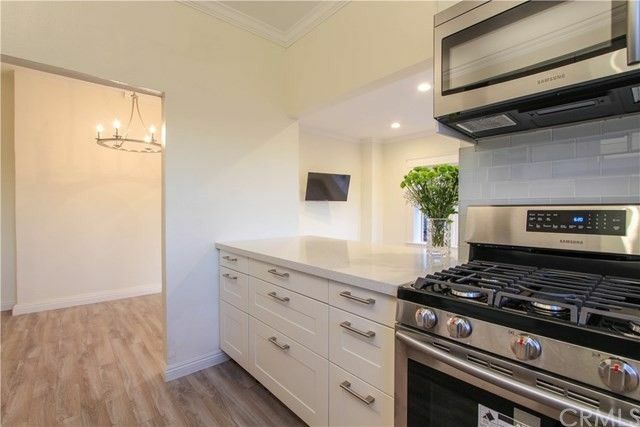 Welcome home to your stunning and fully renovated Smart home in the Historical Californian Building with Parking!! Built in 1923, this centrally located building is minutes from the beach, restaurants, shopping, Dining, entertaining, transportation and easy freeway access. This fantastic 1 bedroom home features a fully remodeled and updated interior that pays homage to the historical nature and past of this highly demanded building and location. Recent high end updates include: Frameless mirror sliding doors in the bedroom, modern crystal chandeliers throughout, new Driftwood Bay flooring throughout, Crystal white Quartz counter tops with glass tiled backsplash and brand new kitchen island with pass through, New Samsung stainless appliance package with French door refrigerator, New Samsung smartTV, Amazon Kitchen Tablet, stunning bathroom with marble counter tops and surrounds and a jetted tub along with designer glass shower door with LED shower head and new fixtures throughout, new interior doors and hardware and a keyless entry door lock and more. This is a modern home with historical charm that will be sure to impress! The open floor plan and corner location take advantage of the fantastic city views and natural light. Common areas include a solarium at the top level, a common living room, and a laundry room on the lower level. Live in an amazing downtown location with The Pike, Pine Ave.,East Village Arts District, The Promenade right out your front door!